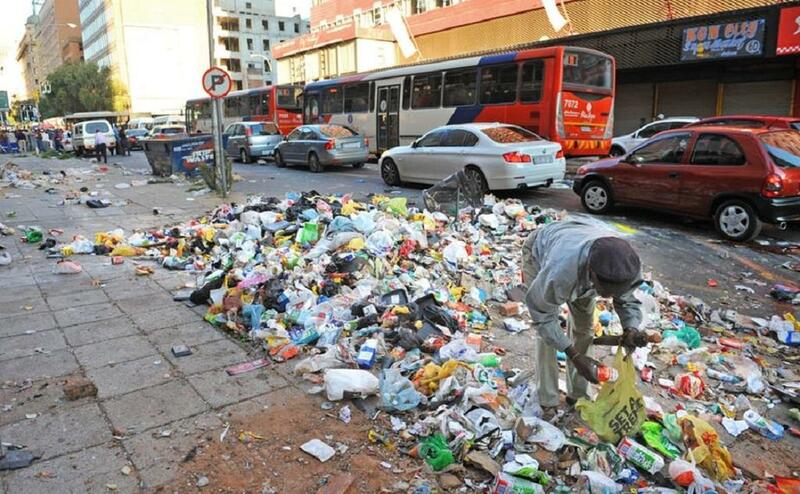 It is common when municipal workers go on strike in South Africa to resort to upturning garbage cans and strewing litter around city centres. Their message is clear: we may be at the bottom of the social heap, and you may think we are human trash, but by God, society needs us, and if you don’t listen to us and give us a living wage, we’ll make you pay for it. Trashing a city is more than a demand for a better wage. Often, it’s also an expression of rage against employer arrogance or unaccountability, and a demand for basic respect. Such tactics are manifestly expressions of class struggle and class power, workers resorting to their most effective weapon. While they are unlikely, in extremis, to be able to confront the armed might of the state, they may well be able to make city managers and the general population wilt in the face of the stink and mess of uncollected garbage. Yet such actions are indicative of a discordant society, and a culture of littering can tell us a lot about a society’s ethos. Littering is an act of individual or group disposal of waste at the public expense in terms, not only of the cost of public collection, but also at worst, of public health, and always in terms of public enjoyment of the environment. It prioritises the private interest over the public, and places the burden of collection or consequences of litter on the collective. Doubtless too, it is expressive of class, income, status and power. It is no accident that in most – if not all countries – better-off residential areas are likely to be freer of litter than worse off localities. They have more public clout and more private resources. Littering tells us a great deal about community spirit. It is surely no accident that the Scandinavian countries, which regularly top the World Happiness Index, are relatively litter free. Their governments have long prioritised the collective interest and there is less social inequality than in similarly industrialised nations. Industrialised countries such as Britain and the US are rich, but they’ve embraced austerity and encouraged rampant consumerism, making them sadly notorious for being far more publicly dirty, as captured by Kenneth Galbraith’s (1958) critique of “Private Affluence and Public Squalor”. South Africa has similarly developed a culture of externalising private costs onto the public, a culture of not caring about the environment which has been emblematic of the country’s mining industry for more than a century. South Africa is a country still deeply divided along lines of race, class, and geography in which there may be a public, but a limited sense of “public interest”. It’s a country where the needs of the better off were historically always prioritised over those of the poor. For example, the expansion of the road system was accompanied by the massive expansion of white suburbia from the 1960s, where tellingly, pedestrians – many of them black domestic workers going to and from work – were denied pavements and left to walk in the road. Because the white inhabitants of suburbia were ratepayers, and because they employed domestic labour to tend to their verges, they enjoyed a generally litter free environment. The scholarship is not available to tell us about the state of litter and waste in the townships at that time, but we may guess it was distressingly different. Today, the South African environment is pockmarked by the detritus of mass consumption. The culture of takeaway culture is also the culture of throwaway, and if there is no litter bin available, or if it’s full, too bad. It’s just easier to dump. So, what if it adds to the mess? Does anyone really care about the one more bottle or can lying on the ground? There are worries, as there should be, that the appalling littering along South Africa’s highways and the litter to be found even in many of South Africa’s beauty spots, is a threat to our tourist industry, and that in turn, means fewer jobs (let alone less general enjoyment). Yet the problems resulting from poor disposal of waste run far deeper. Yes, the fast food industry and the supermarket chains, which have a fetish for unnecessary packaging, have much to answer for. But the externalisation of production costs onto to the public is hard-wired into South African industry. South Africa is a country whose industrial origins lie in mining, and mining systematically produces massive waste and pollution which often has hugely detrimental effects on the environment and public health. This culture continues today, sadly encouraged by lax governmental environmental supervision and excessive concern for profits, investment and private gain. “Littering” by individuals is merely the expression of a far wider selfish – and publicly, costly - culture. There are no great mysteries about how to address the issue of litter. What is needed first is the political will. This in turn requires the recognition of the importance of the problem. There is more at stake than what many people might consider to be merely a middle class distaste for littering and general physical untidiness. Indeed, any presumption that middle class people have a greater dislike of litter than working class people or the poor needs itself to be questioned. After all, poor people bear the brunt of the problem. Where there is litter, there is filth, and where there is filth, there is disease. Political will must be backed up by public resources, and all the paraphernalia of waste collection – from collection lorries, appropriate waste sites and disposal mechanisms, and litter bins. So much is obvious. Yet what is also required is far greater effort by government and ordinary citizens to curb the waste encouraged by excess packaging. South Africa’s recycling industries – providers of thousands of jobs in the informal sector – need to be backed up by greater requirements imposed on retailers to provide collection points for plastic, cans, bottles and so on. The lack of effort by municipalities to encourage recycling by requiring householders to sort their waste into categories is scandalous, especially in middle class, high consumption areas where this would be easy to implement. Legislation to curb use of plastic is spreading around the world, and South Africa should not want to be left behind. A cleaner environment, cleaner air, cleaner towns and cities, needs to be placed firmly on the public agenda.